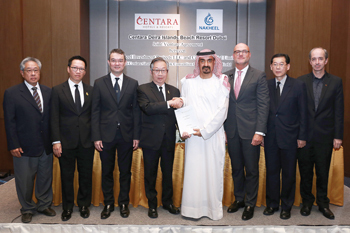 Officials of Nakheel and Centara at the signing ceremony. Nakheel’s partnership with Centara is the developer’s second international joint venture at Deira Islands. Work on the first, an 800-room, Dh670-million ($182.3 million) beachfront resort with Spain’s RIU Hotels & Resorts, is already under way with construction proposals currently being assessed. Set to open in 2020, the resort is the first Centara facility in the UAE and will cover an area of almost 300,000 sq ft. The key features will include a waterpark, multiple restaurants including alfresco rooftop dining options, kids’ club, spa and fitness centre, and business facilities. Recent enhancements to the hotel’s design have added 50 rooms to the original plan, bringing the total number of keys to 600. The joint venture will deliver a family-centric lifestyle destination at Deira Islands, Nakheel’s new, 15.3-sq-km waterfront city that is set to become Dubai’s newest tourism hotspot, remarked Nakheel chairman Ali Rashid Lootah after signing the deal with Centara chairman of the board, Suthikiati Chirathivat, at a key ceremony held in Bangkok. The resort will be managed by Centara, whose portfolio already includes over 14,000 room keys across 67 hotels and resorts in Asia, Indian Ocean and the Middle East. “This strategic joint venture underlines our commitment to bringing new hospitality concepts to Dubai in line with the government’s tourism vision,” stated Lootah. Chirativat said the official formation of the joint venture company and signing of the hotel management agreement is the natural next step following the joint venture agreement last December. This is the rubber stamp that paves the way for the finalisation of the design and development of our first resort in the UAE, he noted. “With Nakheel’s development expertise and Centara’s record of delivering best-in-class hospitality and inspiring extraordinary guest experiences, we will create a unique resort that will surprise and delight guests for years to come,” added Chirativat.